Passing out because of pain is not uncommon but rather scary. It is necessary to learn about the causes of this condition and how you can deal with it. Fainting, or syncope, is a decreased flow of blood to the brain which causes loss of consciousness and posture for a brief moment. There are many possible causes of fainting. Among those are heart problems, such as irregular heartbeats, seizures, anxiety or panic attacks, hypoglycemia or low blood sugar, anemia, and nervous system problems that affect your blood pressure. Apparently healthy people sometimes pass out, and it is important to know when one must see a doctor. However, there are situations in which people pass out from extreme pain, let's find out why it happens and how to deal with it. What Are the Causes of Fainting? The causes of fainting may be multiple. A vasovagal attack or a nerve-related syncope is a simple episode, which is the most common cause of fainting. This mostly occurs in children and young adults. It is due to a sudden drop in blood pressure, which lessens the amount of blood passing through the brain and causing a loss of consciousness. Before the attack, the victim will feel a sensation of warmth, lightheadedness, nausea, and what is referred to as a visual gray out. Normally, the attack happens while one is standing. A seizure can be triggered if fainting is prolonged. Why Do People Pass Out from Pain? Your blood pressure and heart rate are regulated by your autonomic nervous system. When sudden pain occurs, your blood pressure and heart rate can dramatically decrease, affecting the amount of blood flow to the brain. Fainting is the result of this stress on the body, chiefly the abrupt decrease of blood flow. There is no scientific evidence supporting the idea that a person’s pain threshold is related to fainting, although every individual has a different pain tolerance level. The reason why pain tolerance differs from one person to another is still unclear. Certain studies suggest that some people can endure more pain than others because of an underlying genetic component. Passing out is one of the body’s self defense mechanisms. 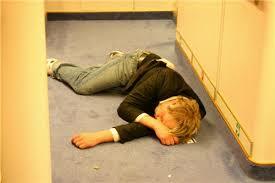 Passing out puts the brain in a calmed state and causes it to shut down for a while or black out. In the process, brain chemicals or neurotransmitters such as serotonin and endorphins begin to accumulate in the brain. The adrenal glands also begin to work to produce hormones that help you recover from fainting. A very important note is that if this happens often, remember to keep tabs on how often you experience fainting in order to avoid anything more serious. “I had a severe headache with sharp pain and I passed out after what felt like forever. When I regained consciousness, I couldn’t speak and I had a really bad pain in the neck. I’ve been having a bad headache for the last two days. The doctor says I fainted because it was a “typical migraine”. Do other people also pass out? I’ve been doing it 4 times in the last couple weeks. My blood pressure and everything else came out normal, so the doctors say it is just “stress”. What can you do if you feel like you're going to faint? Lie on your back flat on the ground and put your legs up on an elevated surface like a chair or against a wall, or sit down and put your head between the knees. Squat with your weight on your heels. This is very effective and will attract less attention in public. Stay in this position until you feel better then get up carefully. If symptoms come back, go back to the position. Check the person’s breathing and airway. If needed, begin CPR and rescue breathing and call 911. Free the airway by loosening the clothing around the neck. Bring the person’s feet up about 12 inches above heart level. Turn the person to make them lie on their side if he has vomited to prevent choking. Keep him lying down in a quiet or cool place for about 10 to 15 minutes, or let the person sit forward with the head between the knees. Feels chest discomfort, pain, or pressure. Has a loss of bowel or bladder control, convulsions or tongue injury. If you faint often, have never passed out before, or have new symptoms with fainting, you should see a doctor even if it is not an emergency situation. Arrange an appointment with your doctor as soon as possible. Some medicines like those used for high blood pressure, depression, anxiety, and allergies, which may cause a decrease in blood pressure. Heart disease, a heart attack, abnormal heart rhythms, and stroke are less common, but more serious causes of fainting. However, these are more likely in people over the age of 65 years old.